These are some of the first images of FPB 64, the production version of the ground-breaking blue-water motor boat Wind Horse, which MBY tested in June 2009. 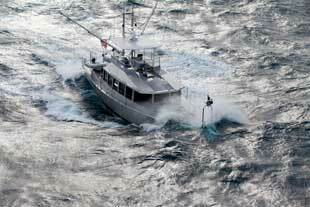 Built in New Zealand by boatbuilder Circa Marine, which specialises in aluminium construction, the FPB (Fast Pilot Boat) 64 is the brainchild of Steve Dashew. The American has spent much of his life designing and building long-range cruising craft, and created the FPB 64‘s predecessor, Wind Horse, or FPB 83, from scratch after deciding he was too old for yachts. 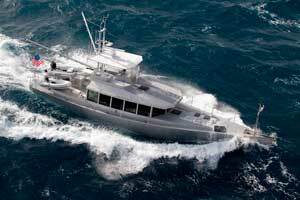 This boat, Avatar, is one of three FPB 64s that will be built by the New Zealand outfit but further build numbers are dependent on customer demand. Berthon International will market the FPB64 throughout Europe from their base in Lymington, on behalf of Steve Dashew. The boat is highly customisable and can be adapted to the owner’s wishes but the approximate base price is US$2.5 million.